Driving through Kansas, you’ll see many billboards that aim to lure you off your path to discover some of the attractions the state has to offer. 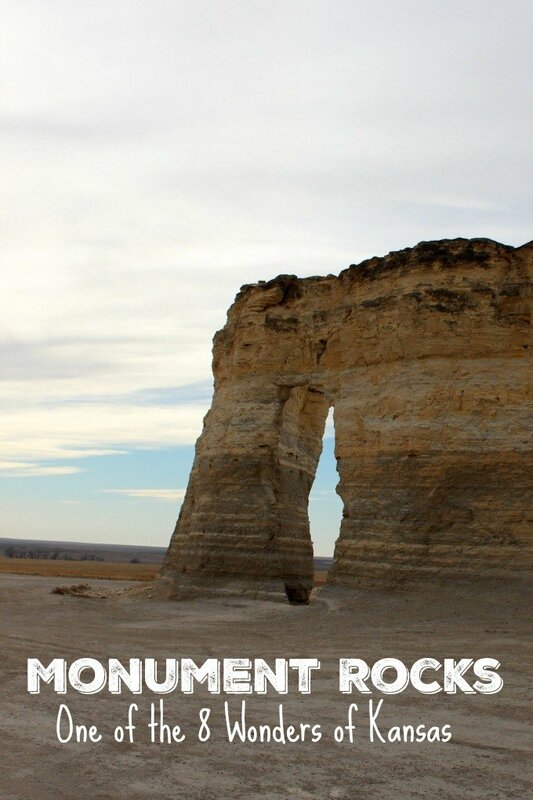 Monument Rocks is one such billboard that we’d seen. 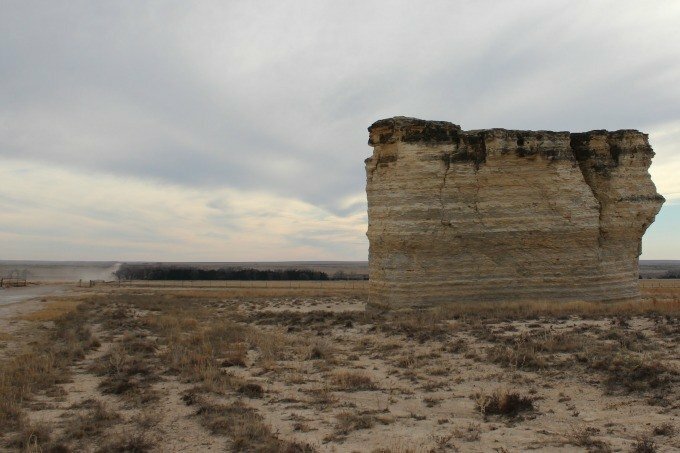 With eyes and GPS focused on Castle Rock, an outcropping of rocks that resemble, you guessed it, a castle somewhere in Kansas, my husband and I had no interest in leaving our carefully plotted path to visit Monument Rocks. But after traveling the flat, open prairie of I-70 through Kansas, with aching rears and legs that begged to exit the vehicle and take a stroll, I convinced my husband that the Buffalo Bill monument in Oakley was a must see. 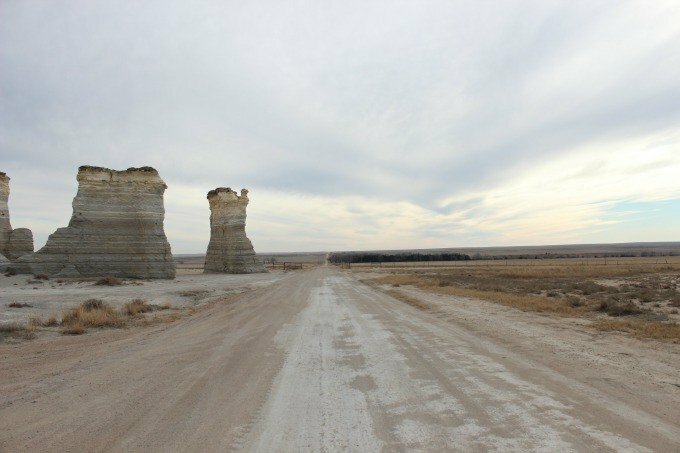 We pulled off the interstate, stopped at the larger than life statue and read more about Monument Rocks, which was located about 25 miles away. How could we resist? Back in the SUV, we traveled along US Hwy 83 for what seemed like miles and miles. 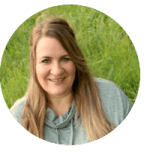 Just when we thought we’d misunderstood the directions and were ready to turn around and accept defeat, we saw a large billboard directing us to turn on a dirt road. We followed the arrow onto Jayhawk Road for about three miles. 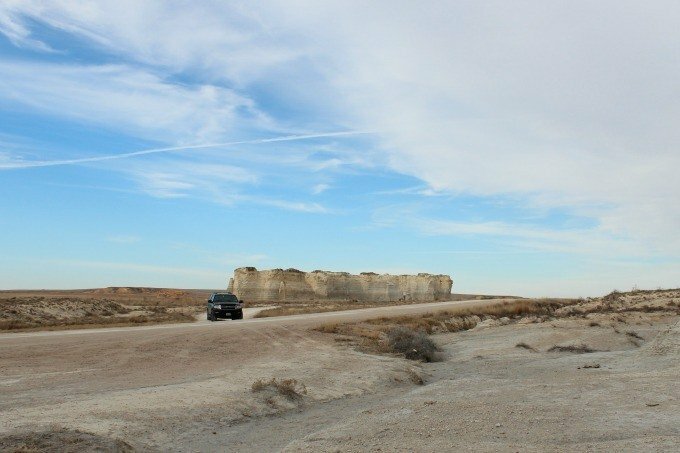 When the road ended, we found another sign, directing us right to follow another dirt road that zig zagged over cow grates through the countryside to give us a glimpse of the Badlands of Kansas. 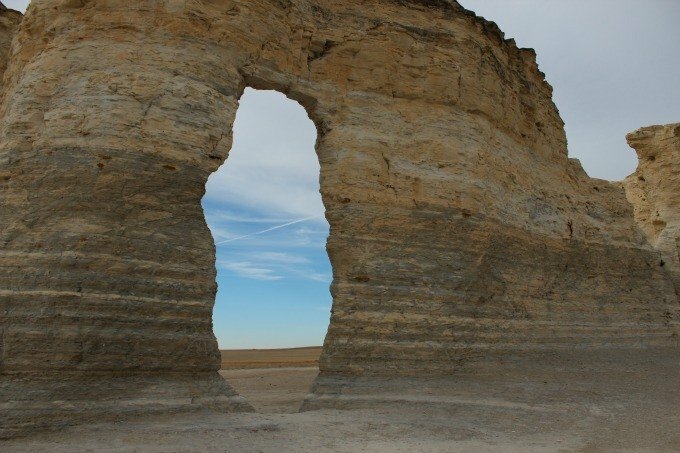 Known as both Chalk Pyramids and Monument Rocks, these landmarks in Kansas were definitely worth the detour. The rocks, recognized as a National Natural Landmark, are located on private property, but generously made available to the public- and at no charge. 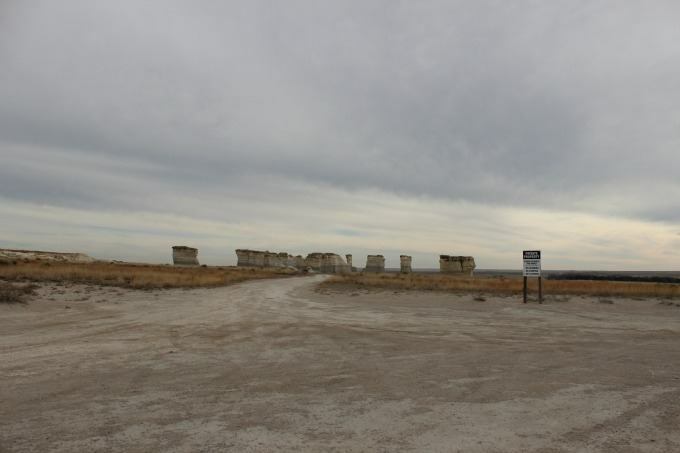 They are also considered one of the Eight Wonders of Kansas, a fun title that persuades roadside attraction lovers like myself that we must take the time from our road trip to visit. The rock formations, which stand 70 feet tall, are said to be the remnants of an ancient seabed. If you look closely, you’ll see dozens, if not hundreds of fossils under your feet and embedded in the layers of the wind-carved chalk pinnacles. Look, take photos, but do not disturb the fossils. Climbing and camping are prohibited and if you pack a picnic to enjoy in front of this magnificent backdrop, make sure to pick up your trash and take it with you when you leave. Let’s all do our part to ensure these marvels of nature can be seen by future generations. 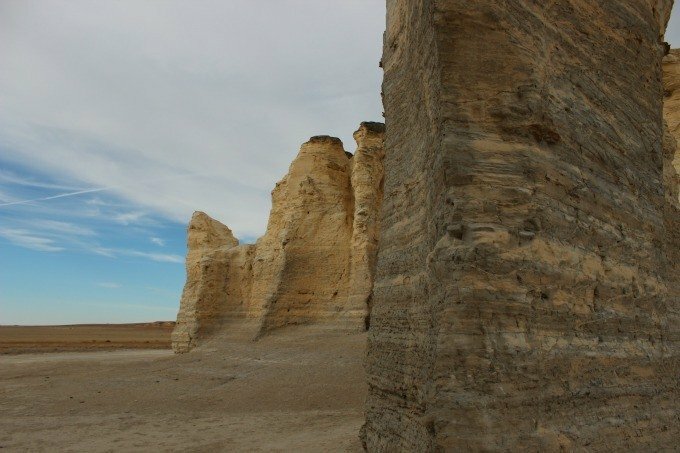 Monument Rocks was one of my favorite stops on my road trip through Kansas. If you have the time, I highly recommend it. Keep in mind, you are on dirt roads so this route may be best traversed in dry weather. From I-70, take exit 76. Drive along US Hwy 40, towards Oakley for two miles and turn left onto US Hwy 83. 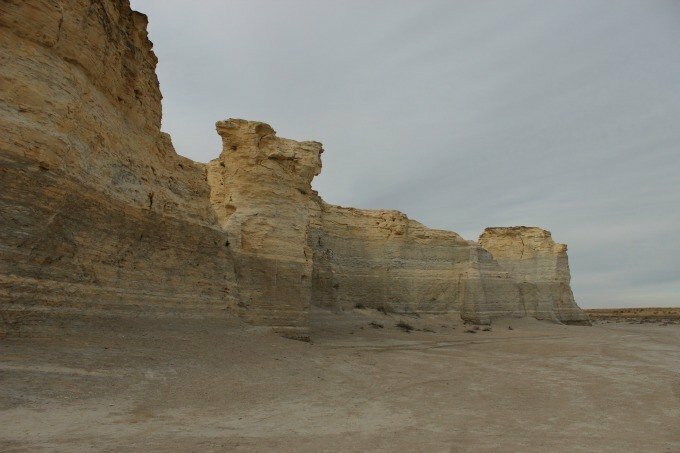 Drive for about 15 miles until you see the large billboard pointing your way to Monument Rocks. Turn left onto Jayhawk Road. Drive to the end of the road, turn right and continue until you see the rock formations in front of you. The road goes right between two outcroppings of rocks. You’ll find plenty of parking and room for larger vehicles. 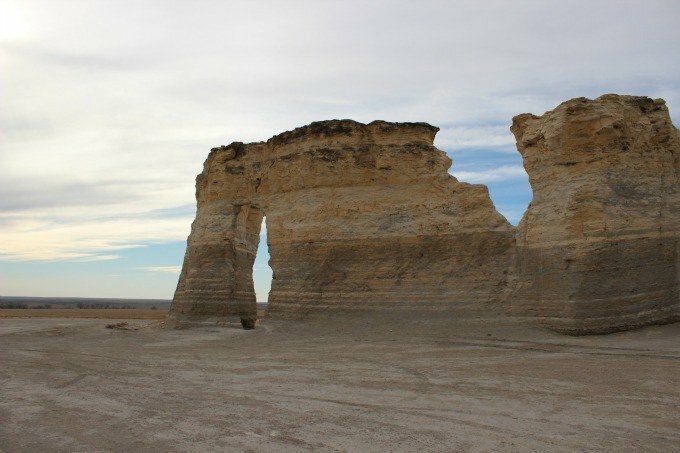 Have you seen the Monument Rocks or Castle Rock? What advice would you have for someone who’d like to visit this wonderful natural and roadside attraction in Kansas? © 2016, Tonya Prater. All rights reserved. i am from wichita and planning a weekend driving trip around Kansas with kids I will DEFIANTLY stop here—where else do you recommend? There are stops all along I-70 that are great. Goodland, KS has a giant Van Gogh painting. Easy on/off the interstate. 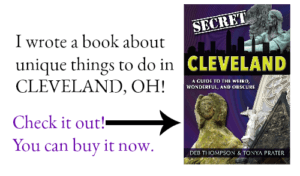 Pick up a brochure on this town. They have smaller paintings on easels in several of their parks. The Cathedral of the Plains is right off I-70. Abilene is a fun stop- Eisenhower Boyhood Home and Presidential Library, the Greyhound Museum, world’s largest spur at the fairgrounds and a mansion that is one of the 8 wonders of Kansas. Wamego has an adorable park with windmill and other buildings and a Wizard of Oz Museum- definitely a fun stop and I’m not a huge Wizard of Oz fan. Manhattan has Johnny Kaw and some great historical buildings. Historic Fort Hays is another stopthe kids may like. Looks like a cool side trip my next time in Kansas! Thanks for the good photos as well. I really love road tripping through Kansas. There are so many unique attractions to see. These look amazing! I’ll definitely check them out when I’m in Kansas! I’ve never been, but I’d love to go! I’m thinking of doing a road trip out west so I might just have to stop there! I love your photos and thanks for all the great info! It’s a wonderful stop. It was a bit further out then we had intended to go, but I’m so glad we made the trip.